One of my favorite summer activities involves maps. We used to make maps of everything. We made treasure maps, maps of the neighborhood, maps of anything they were interested in. We had a vast collection of maps – AAA road maps, several atlases of the US and world, maps from places we had visited (the zoo, Mt Rainier, campgrounds, walking trails, etc). If it was a map we kept it. One summer we made a map of all the libraries in Seattle. Then we set out to visit as many libraries as we could and found that most of the libraries are close to a park, a pool or a playground. Sometimes we took the bus (maps are part of the bus schedule), sometimes we drove and sometimes we road our bikes. Each trip to the library was an adventure. There were opportunities to discuss architecture, look at the plants in the gardens, find new books to check out and check out nearby places to explore. something of their own with which to compare. Children learn so much from maps and feel so important when they are the keeper of the map. As they choose the route on the map and find the animals at the zoo they have been given the responsibility of the whole group’s outing. It gives them a chance to develop spatial skills, pre- reading and reading skills, visual orientation and mental awareness of their surroundings. By seeing where they are in context with what is around them. You can make a line on the zoo map that shows where they have been, where they are and what direction they are going. ​​​​As children learn what is around them they are learning how they fit into this family, this neighborhood, this city and this world. Maps help center them in their environment…and they are fun. You can start by mapping their bedroom and having a treasure hunt in their room. Then map the house, the neighborhood walk you go on and move on from there. 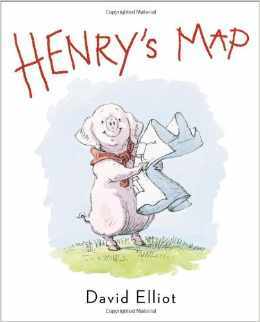 Henry’s Map by David Elliot. Learning about maps is creative, educational and fun. Enjoy! everyday play and experiences give them the basis for the geographic knowledge that they will learn in school. With just a little encouragement and some direction, young children will develop the vocabulary, awareness, and curiosity that will help them better understand and learn geography.